My fellow Americans, it is time to speak the truth, the whole truth, frankly and boldly. We must not shrink from honestly facing the harsh economic conditions in our country today. This great nation will endure as it has endured, will revive and will prosper. And so, I wish to reassert my firm belief that the only thing we have to fear is fear itself. 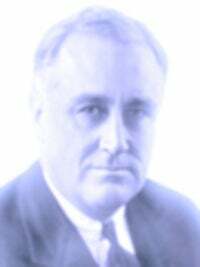 That and me, of course, the ghost of Franklin Delano Roosevelt. Be very afraid of me! Only a foolish optimist would deny the dark realities of this moment. Though the future we face is grim, we must always remember that the real terror is not the situation before us. No, the real terror is, in fact, me. The haunting specter of the 32nd president. See how I jostle your cabinet doors and make the floorboards creak? What a bone-chilling sight! How could anyone focus on the collapsing banks when the author of the New Deal is floating around their living room? Just look at my ragged, billowing clothing! It hangs upon my withered form as I pass through walls and disappear into the shadows. Why, the hair on the back of your neck is no doubt on end just thinking about me, a long-deceased member of the Yalta Conference's "Big Three." I am, you must admit, at least 10 times more frightening than a nationwide credit freeze. Am I scaring you right now, my fellow Americans? Wooo! You are no doubt cowering in fear of me, our nation's only four-term president, as I wheel toward you in the dead of night, arms akimbo. Yes, that's right. I'm still in the wheelchair. Doesn't that make me scarier in a way? Scarier even than, say, the prospect of being scared? Take comfort, though, for your distress comes from no failure of substance. Plenty is at our doorstep, and the road ahead is long and arduous. Not to mention you're being haunted by the ghost of FDR—inventor of the Social Security system and the Securities and Exchange Commission—arisen from the grave to appear in your bathroom mirror! What could be creeeeepier than that? Compared to me, this recession is nothing. We may be in another dark hour of our national life, but just wait until the dark hour of tonight, when you're drifting off to sleep and you hear a deep moan, and your heart starts beating like a jackrabbit's because you know that, if you open your eyes and turn your head, ol' FDR is going to be sitting right there, staring at you with this creepy smile on his face. Or maybe I'm not smiling. Yes, that's much scarier. I'm just staring at you, unsmiling. Or perhaps I'm not even looking at you at all, but just sort of gazing off into the distance with this eerie, forlorn expression. Try and beat that, declining consumer spending! In summary, never be afraid of your own fear. These dark days will be worth all they cost us if they teach us that our true destiny is not to be ministered unto but to minister to ourselves and to our fellow man. We must always look to future and never behind us. Never, never, look behind us. Especially not right now! Look! What's that behind you? It's me! The ghoooooost of Franklin Delaaaaano Rooooooosevelt, dead these 64 years! I have come to haunt you!